Quillan came to us with his brother Harry in 1994 when Liz and John Keene were kind enough to let us have litter brothers. Liz asked us to 'give showing a go' and so, with some trepidation, we agreed. Quillan quickly was winning puppy breed classes and thrilled us when he won BPIS at Southampton show at the age of 10 months. He soon began to win BOBs at the large Open shows held in the South West of England. 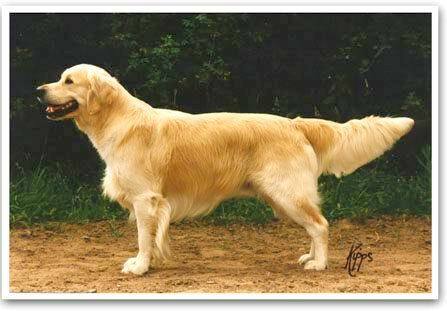 He qualified for Crufts, winning Post Graduate Dog at the Three Counties Championship Show in 1996, under the late Brenda Hall (Stirchley). Quillan went BIS at the Minehead Open Show in 1996. We were delighted that at his first show in Ireland he won a Major Green Star and BOB at the Fermoy Championship Show. Quillan also went BIS at the Ballymote Open Show in Sept 2001 and weeks later he took the Gundog Group and went RBIS at the well entered 'Guide Dogs' Open Show in Tralee. He competed in three of the 2002 Munster Circuit Championship Shows, winning two large Open Dog classes and at Tralee taking the Reserve Green Star at 8½ years of age. Quillan was a fun dog and loved his daily walks over the sand and estuary, swimming with his 'wife' - Sassie, his two daughters, his brother, three grandchildren and his great-grandaughter - Delia. We miss all of the old ones that have left us, especially our two Shinehill Boys. Rest well lads!